Sports is often thought of as a dog-eat-dog world. But as this funny, touching, and evocative documentary makes abundantly clear, competitive eating is really dog-after-dog. 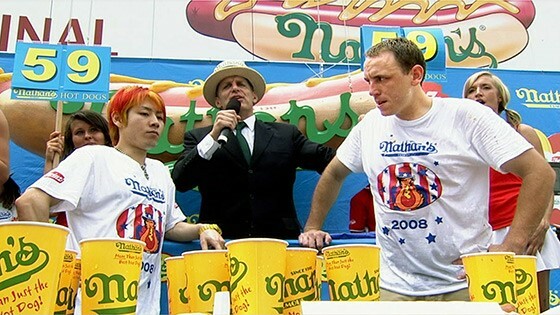 And the two biggest dogs in the heyday of the sport were Takeru Kobayashi, a slim zen master from Japan, and Joey Chestnut, a barrel-chested everyman from northern California. Directed by Nicole Lucas Haimes, THE GOOD, THE BAD, THE HUNGRY traces the lives of these unlikely superstars, whose careers were bookmarked by the July 4 Nathan's Famous Hot Dog Eating Contest. The annual contest would be nothing without the carnival barker in the straw boater hat, George Shea, who also serves as the puppet-master for this tragicomedy. A latter-day P.T. Barnum, Shea turned major-league eating into a magnet for TV ratings and advertising dollars. But heal so fostered a jingoistic atmosphere that literally kept the sensitive Kobayashi away from the Nathan's stage, which was a shame for many reasons. As extended interviews with Kobayashi and Chestnut reveal, they had similar upbringings, each featuring a loving family and plenty of food. The undeniable core of their rivalry is that, as long as they were devouring hot dogs and pizza and cow brains, the public ate them up.